I made this post on CCRx about the research papers I have regarding CCRs and Fault Tree Analyses, and it got some positive comments so thought I would repeat it here to a much wider audience – feel free to cross-post/share. http://www.hse.gov.uk/research/rrpdf/rr436.pdf – Formal risk identification in professional SCUBA (FRIPS) – This report describes how fault tree analysis and failure modes and effects criticality analysis (FMECA) can be carried out on activities and hardware typical of a professional SCUBA diving activity. The methodologies are described and conclusions drawn from each technique. Examples are given of how the techniques can be used to assess diver risk in a quantitative way to aid assessing equipment configurations. https://www.shearwater.com/wp-content/uploads/2012/08/Underwater_Technology_Paper.pdf – The use of fault tree analysis to visualise the importance of human factors for safe diving with closed-circuit rebreathers (CCR) – Closed-circuit rebreathers (CCR) have been used for many years in military diving but have only recently been adopted by technical leisure divers, media and scientific divers. 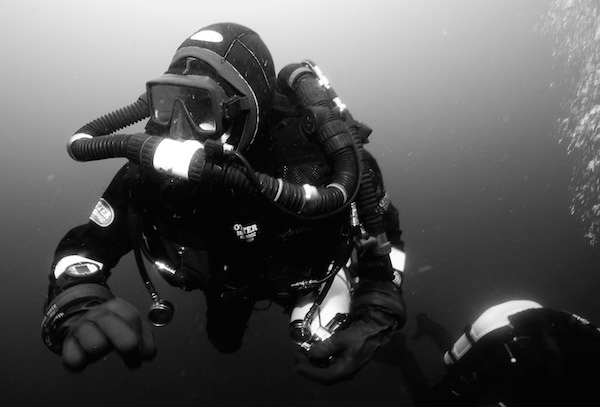 Rebreather divers appreciate the value of training, pre-dive checks and equipment maintenance but it is often difficult to visualise just how important these factors are and how they inter-relate for a rebreather. In this paper, the well-known tech- nique of fault tree analysis (FTA) is used to identify risk in a rebreather. Due to space constraints, only the branch of the tree for unconsciousness as a result of hyperoxia is considered in detail but, in common with the whole tree, end events are shown to be human- factor related. The importance of training to the emer- gency situation, the use of formal pre-dive checklists and the value of good design to prevent accident escalation are discussed further. http://www.hse.gov.uk/research/rrhtm/rr871.htm – RR871 – Assessment of manual operations and emergency procedures for closed circuit rebreathers – Closed Circuit Re-breather (CCR) diving has become increasingly popular as more sophisticated units enable diving for longer and at greater depths. CCR diving is much more complex than traditional open circuit diving in many ways and there is an increased potential for problems and diver errors to emerge. However, formal research examining CCR safety has been rare. To address this, the UK Health and Safety Executive commissioned the Department of Systems Engineering and Human Factors at Cranfield University to conduct a scoping study into the human factors issues relevant to CCR diving apparatus. The scoping study was designed to explore five principal subject areas: accident / incident analysis, unit assembly / disassembly, normal / non-normal diving operations, training needs analysis, interface and display. This scoping study has approached this with a series of studies each addressing separate issues that are relevant to the principal subject areas. These studies can be seen as potentially stand alone, each with its own objectives, method and results. These studies comprise; Accident / Incident Analysis; Human Error Potential Analysis: Assembly and Disassembly; Human Error Potential Analysis of Diving Operations; Training Needs Analysis; Interface and Display Recommendations and Human Error Potential in Non-Normal Operations. http://www.dhmjournal.com/files/Fock-Rebreather_deaths.pdf – Analysis of recreational closed-circuit rebreather deaths 1998–2010 -There is a probability failure tree for failure modes of both OC and CCR within this paper but the paper mainly addresses the comparative risks between OC Recreational diving and CCR diving. One of the key points though is the lack of quality data when examining the causality of diving fatalities. A MSc research paper resides in the Cranfield Library by Elizabeth Humm published in 2010 examining Human Factors in CCR but is does not consider the Failure Modes of the CCR assuming that “they are fit for purpose“. ← How Much Are You Willing to Risk?